Sometimes you come across a pickup that really makes the hair on the back of your neck stand up. The sort of pickup that, when you’re thinking that you’re done playing for the day, it makes you want to keep on playing even longer. 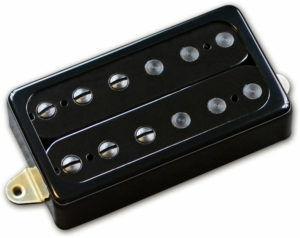 The MojoTone PW Hornet is one of those pickups for me. Let me throw some specs at you before we get started. Given that I generally go over specs later in a review, I thought it might help to get an idea of the specs so that the impact of how the tone transcends the numbers will sink in as we move forward. We have some asymmetrical coils going on, more so in the neck. That’s going to help with a more open vibe, allowing more frequencies to come through. The neck position specs are not at all uncommon. 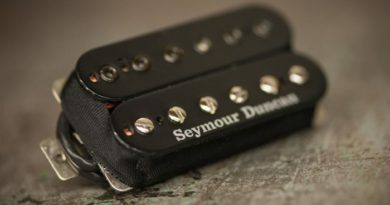 I found the bridge specs interesting, as the DCR fills a bit of a gap left by many pickup makers. As you can tell by the photos, the slugs and screws aren’t quite in the conventional positions. On both coils in both pickups, the screws are under the wound strings and the slugs are under the plain strings. And here’s a curveball…it’s no gimmick. The screws are one alloy and the slugs are another, picked to help fine tune the inductance respective to the wound and unwound strings. The low strings have more focus and the high strings have more body. How do I know that? They told me! That’s right, they are really open with their approach, with an infectious enthusiasm about what they do and how they do it. They seem to have an attitude of doing what it takes to get the sound, even if it might buck against convention….which is what rock-n-roll is all about, isn’t it? 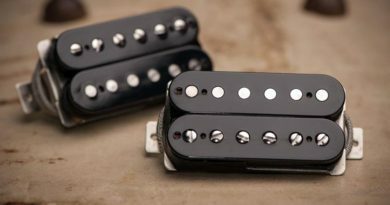 I put these in a double-hum routed super-strat with a poplar body, maple neck, rosewood board and a certain German-made double-locking trem. 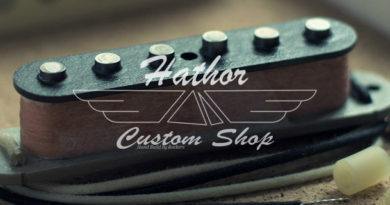 Each pickup wired to mini-toggles for series/split/parallel with a Switchcraft 12120X 3-way toggle for main pickup selection. Both pickups were very easy to dial in the height for a sweet spot. Being really curious about the versatility of the PW Hornet set, I started out with a clean amp setting. I knew something was going on when I was getting a very nice and very usable sound from the bridge in series. Whoa! That is not something that happens with my rig on a regular basis…especially with a ceramic magnet! Going back and forth between the bridge and neck (and both!) in all combinations of series and split and parallel yielded totally usable clean sounds from strumming warm chords to plucking quacky single notes licks. Nothing is shrill or spikey, and nothing is dull or flat or boomy. It is quite accommodating to multiple playing styles. Then I threw things into overdrive with a dirty amp setting, and off I went. Get back, Loretta!! !… this pickup set will leave you in the dust, shooting out sounds that surpass expectation. 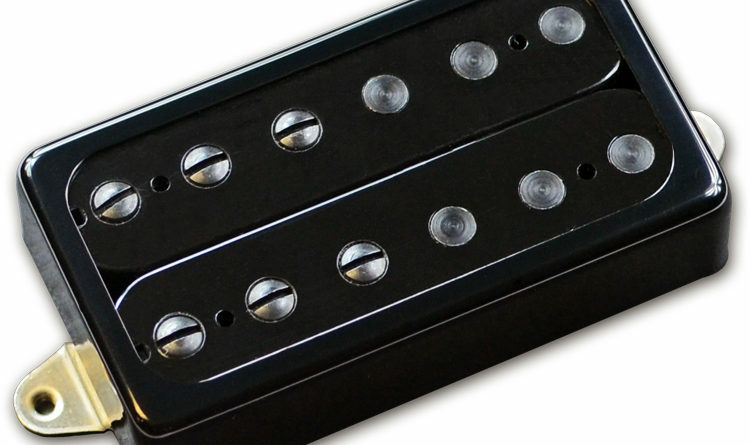 Both the neck and the bridge are excellent for lead work, with plenty of bite and edge to push through the mix. The lows in the neck are big, making your presence known but never loose. The lows in the bridge are also big, but punchy and in control. This is a really fun pickup through a dirty settings, making me want to continue to test it and push it to see what it could do….and I have to say that I cannot find a limit to what the PW Hornet set can deliver. 70s blues rock, 80s arena anthems, virtuoso shredding, 90s/00s progressive rock, pop, metal, even pop-metal. There is an excellent alchemy of power and girth and focus and balance and sweetness and edge and bite. I like pickups. I like a lot of pickups. This is a pickup that I like a lot. It produces a tone that I didn’t even know I was needing and gives me the inspiration to keep on playing longer. If versatility is key, the MojoTone PW Hornet is a pickup that can play the barn-burning gig on Saturday night and then handle a righteous spot in the church band on Sunday morning. 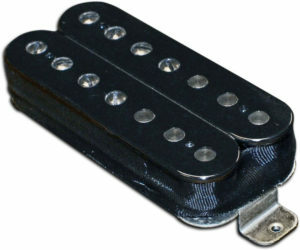 The PW Hornet comes in 6-string (standard and trem spacing, with or without the open-face cover) and 7-string models (direct, standard, and EMG mounting available).